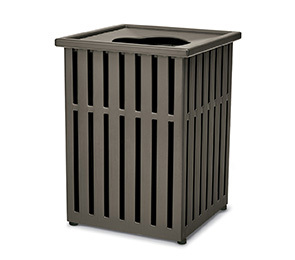 Keep facility spaces neat, tidy and debris free with large Streetside Collection trash receptacles. 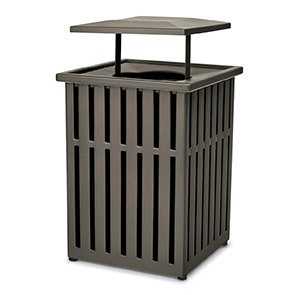 These 40 gallon square receptacles feature a timeless slat styled body, topped by a choice of flat top or rain bonnet lid. Receptacles are finished in a high-performance powder-coating, to protect against all-weather conditions and heavy usage. Model L1397 - 34"H x 25"Sq. Model L1397BT - 42"H x 25"Sq. Lids are contour crafted with a 14" diameter disposal opening and two 14" security straps for easy servicing of the included reusable plastic liner. Bases are pre-drilled to accommodate flexible placement and come standard with adjustable, protective rubber feet. Optional corkscrew anchor for mounting in grassy areas.